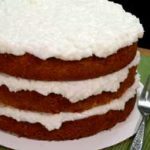 Follow our easy, step-by-step, photo illustrated instructions for making this Sour Cream Coconut cake. You can use a boxed cake mix, or make your layers from scratch like we did. Printable recipe included. It may take 5 days to make this cake, but it will be worth it once you take that first bite. It’s simple to make, but needs to be refrigerated for four days to get super moist. I made this version of Coconut Cake to carry to my older brothers house for our 2018 Christmas Eve family get together. Coconut Cake is one of my brothers favorites. I like them too, as does most of the family it seems. 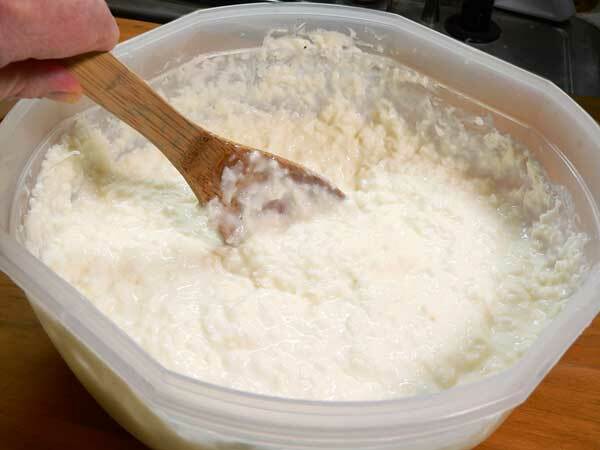 The days may be long gone as to when Daddy would crack open a fresh coconut for Mama to use to make one of her Fresh Coconut Cakes, but those of us that are old enough to remember, still think fondly of those days and deeply cherish those memories. 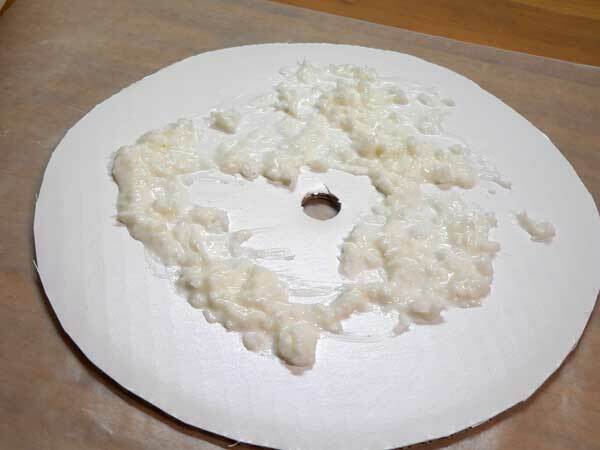 I’ve posted the instructions on How To Open A Coconut here on Taste of Southern. And, I’ve shared the recipe for Mama’s Fresh Coconut Cake made with fresh coconut for you as well if you’re interested in taking a look. Mama’s cakes were always awesome, and I’m thankful that I had many years with her to enjoy them. This particular cake, is adapted from a recipe that was shared on one of our local area TV stations over the holidays. It sounded good, and I decided it would be perfect to try for our Christmas Eve family get together. It does take several days to complete it, so please keep that in mind. You make the frosting one day, refrigerate it overnight, then make the layers and assemble the cake the following day. 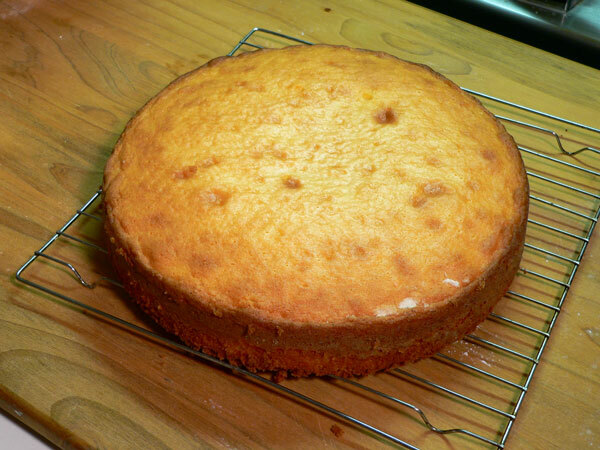 After that the cake needs to be covered and placed in your refrigerator for four days to fully develop its great flavor. The frosting is very liquidy, and that liquid seeps down into the layers as the cake spends some time in the refrigerator. This results in a very moist cake that tastes oh so good. Smile. And, since the frosting is so moist to begin with, we don’t even try to spread it on the outside of the cake because it would just slide off anyway. Just spread it between the layers and on top. At the moment, my cake is on day three of sitting in the refrigerator. I’ve tried the frosting, but not the whole cake just yet. I know it’s going to be pretty awesome though. I’ll try to let you know what the rest of the family thinks about it in just a few days. Ready to try one? Alright then, let’s head on out to the kitchen, and… Let’s Get Cooking! 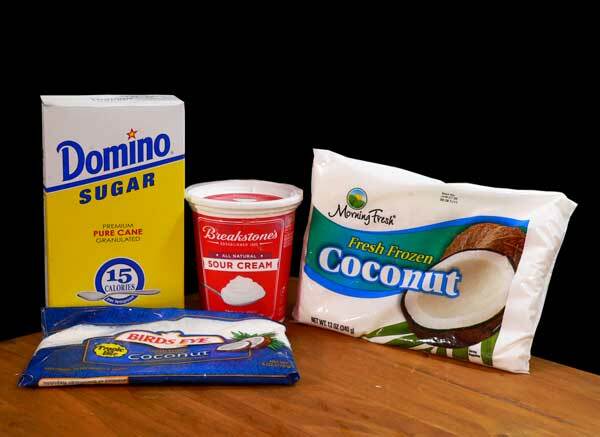 Sour Cream Coconut Frosting – You’ll need these ingredients. You will also need a boxed cake mix to make the layers, or you can follow our step-by-step, photo illustrated instructions for making Basic Cake Layers, from scratch, like we used for ours. Make the frosting first. 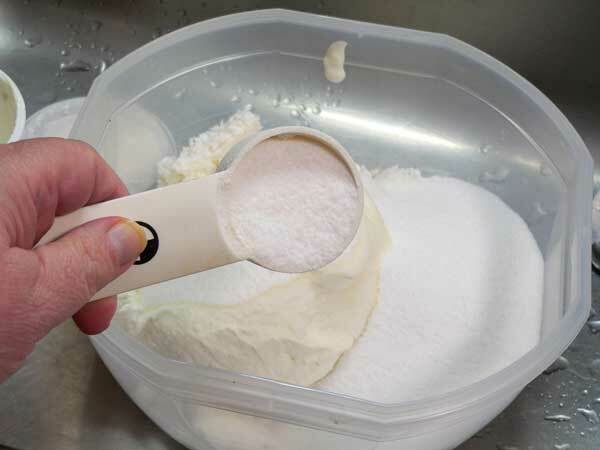 Start by adding the thawed out coconut to a large mixing bowl. Then add the two cups of sugar. Grab a large spoon and mix everything together until it’s fully combined. 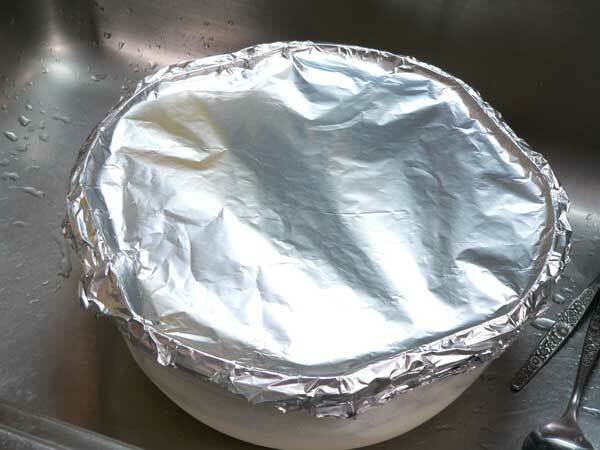 Cover your bowl with plastic wrap, aluminum foil, or a tight fitting lid. 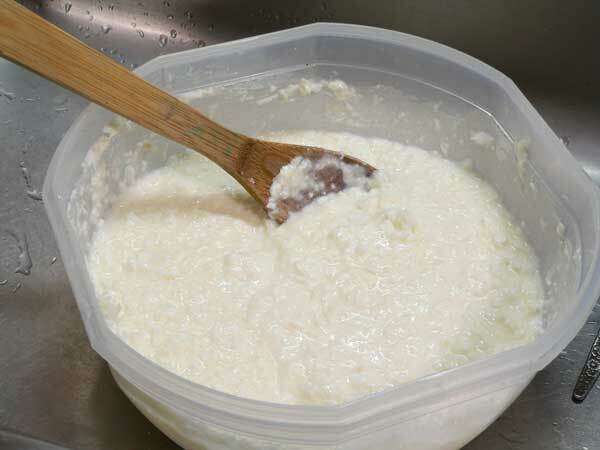 Place the bowl in your refrigerator and let it sit overnight so the flavors can meld together. Prepare your cake layers the next day and let them completely cool before your begin assembling your cake. Ready to do this? 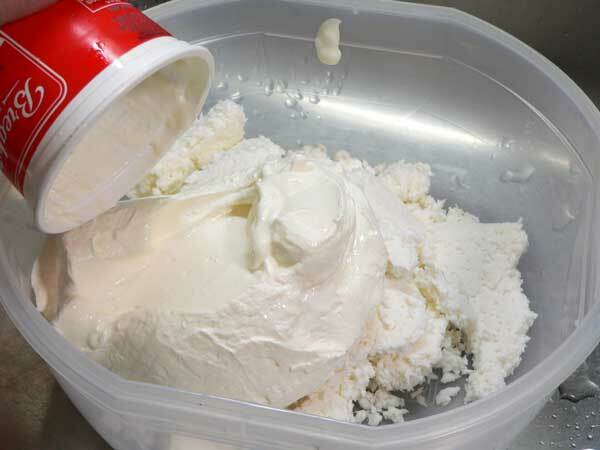 When the layers are ready, remove the frosting from the refrigerator and give it a good stir to loosen everything up. Yeah, you better believe I tasted it. Smile. Spread a little of the icing on your cake board or plate. This will help hold the first layer in place as we proceed with building our cake. Center the first layer on your cake board. 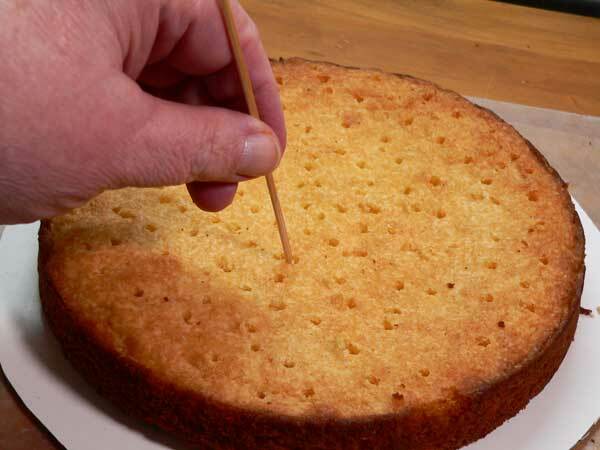 Then, using a toothpick or skewer, poke a whole lot of holes in the cake layer, pushing all the way through the layer and down to the board. These holes will let the juice from the filling seep down into the layers to make the cake super moist. Spread a layer of the frosting on top of the first layer. YES, it’s a bit juicy, that’s the way it’s suppose to be. Smile. 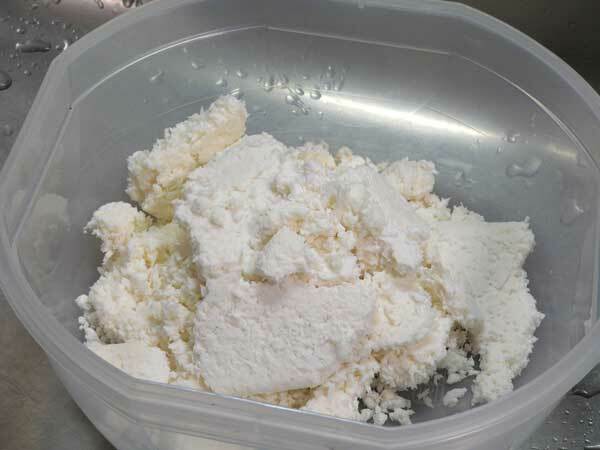 Repeat the same process with the second cake layer. 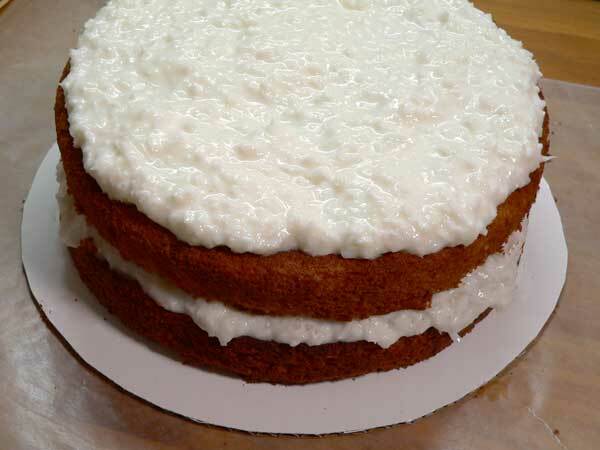 Poke it full of holes, going all the way through the layer, then top it off with another layer of frosting. Add the third layer to the top of the cake. Because the frosting is so moist, I decided to add three dowels to help hold the layers in place. I’m using wooden skewers in this case because I had them on hand. 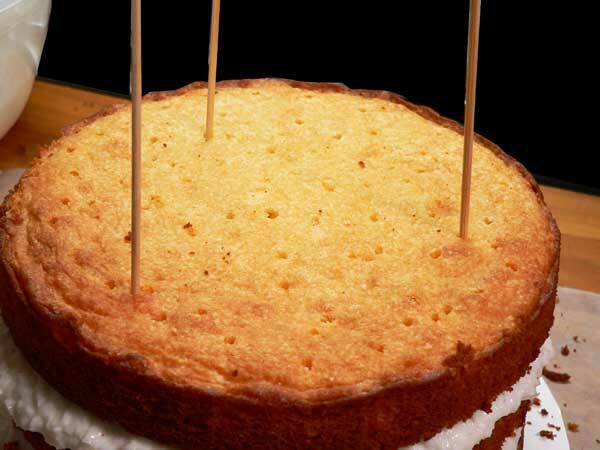 The skewers go through all three layers and down to the cake board. Pull the skewer up about 1/4th of an inch and snip off the top. 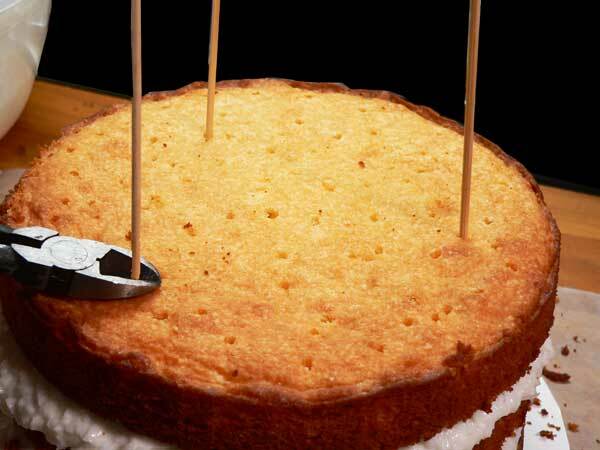 Then, push the remaining skewer back down to the cake board so its not sticking up on top. As you can see, I’ve also poked a good number of holes in the top layer. 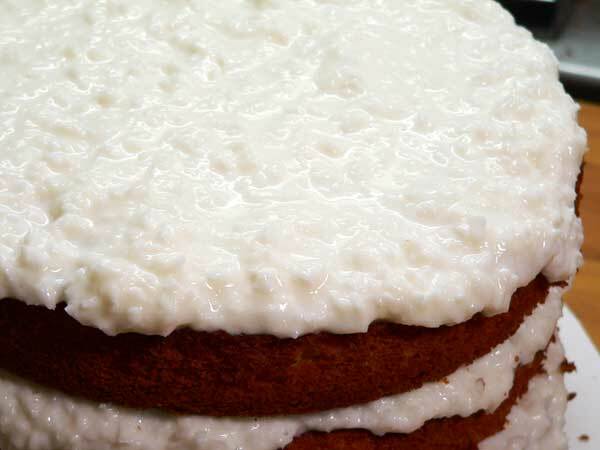 Add an ample layer of frosting to the top layer of the cake. Again, because the frosting is so moist, I’m not adding it to the sides of the cake. It would just slide right off if I tried it. Smile. You also need to work quickly so you can get the finished cake back into the refrigerator. You’ll need a covered cake plate to store the frosted cake in the refrigerator for FOUR DAYS. This time will let the liquid from the frosting seep down into the layers of the cake. The hard part of course is waiting four days until you get to enjoy the cake. Smile. Congratulations, your patience has been rewarded. Now you can enjoy this really moist cake with your family and friends. I hope you’ll like it. 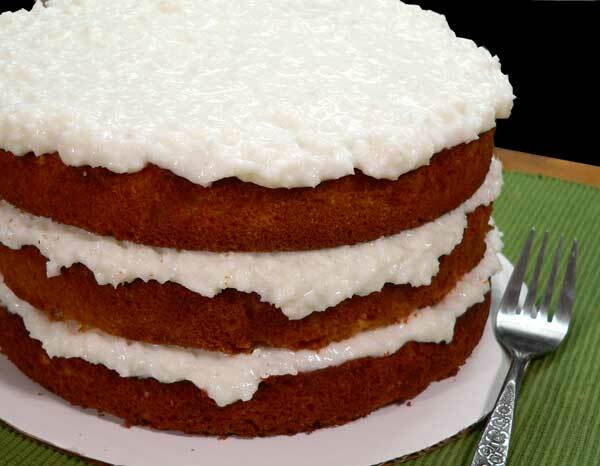 If you decide to try our Sour Cream Coconut Cake Recipe, we’d love to know what you think of it. Share your memories and comments with us. It will only take a minute or two for you to leave your comments in the section below. My grandmother always made this frosting with an orange cake for Christmas! I loved it! I am just now getting around to catching up on emails since before Christmas – you know the old saying “A woman’s work is never done” especially around the holidays. 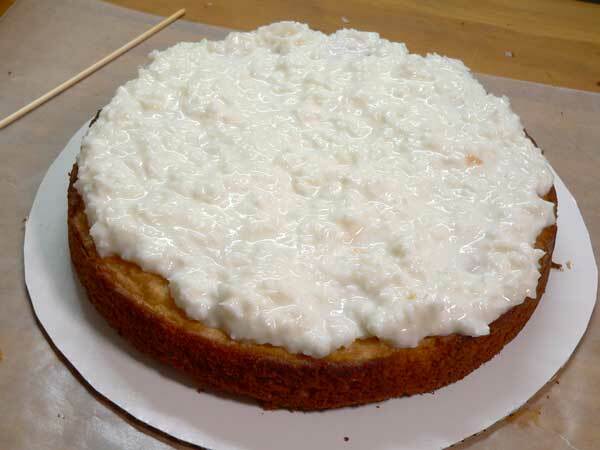 I have made this coconut cake for many years as it is one of my husband’s favorites. The only difference is that I split the layers in half before adding the icing. You should see people’s eyes light up who have never had this cake before when it is served. Six layers are very impressive! It is also very tasty when you use pineapple between the layers (with or without the coconut). I have a few weird family members who don’t like coconut (IMAGINE!). Here’s hoping 2019 is your best year yet! Merry Christmas Steve!! I pray GOD will answer every prayer you have ever prayed, in this upcoming New Year. God Bless You, Steve. Hope you have a wonderful time at your brother’s house with all your family! The cake looks delicious, I will save the recipe for next year. So glad Jan and Billy are doing well, hope you continue to mend. And have a Happy New Year!